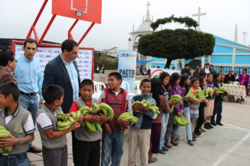 Banasa joins the “Zero Hunger” program of the government of Guatemala and implements a nutritional project with bananas to fight malnutrition in the poorest rural communities of the country’s southwest. Banasa, in partnership with the Nutritional Food Security Secretariat- SESAN [for its initials in Spanish], is carrying out the “Nutritional Reinforcement with Bananas” Project to prevent acute malnutrition in the municipalities of San Pablo and Sibinal of the department of San Marcos, which have been given priority by the government because of its high rates of malnutrition. For three months, Banasa will donate 650,000 bananas to 109 families with cases of acute malnutrition and the School Boards of 220 public schools for the food snack program. With this project, 150 schools and 2,500 families will benefit weekly for a 14 week period. SESAN will train the beneficiaries on the different forms for preparing and consuming the banana and its nutritional properties. Luis Enrique Monterroso, secretary of SESAN, Luis Rivera, departmental governor of San Marcos, Bernardo Roehrs, corporative director of Banasa, and municipal and communal authorities participated in the inauguration of the project, held in Sibinal. Luis Enrique Monterroso of SESAN stated: “We have already made three deliveries in Sibinal. Fifty thousand bananas weekly were distributed in 77 schools of this municipality". “The productive sector has always wanted to promote initiatives such as these. One of the pillars of Banasa is empowerment and community development, and with this project focused on reducing malnutrition, we can help the community overcome it. A malnourished population cannot make it”, commented Bernardo Roehrs, from Banasa. Yanira Fuentes del Valle, housewife of Sibinal, stated: “This is a good project because the banana is a very nutritious fruit. The trainings will help us learn make different recipes with the bananas”. BANASA is one of the largest agribusiness in Guatemala, where it has over 3,500 direct and 10,000 indirect employees who contribute every day to the socioeconomic development of the country and the region.